Super Savings Item! Free Shipping Included! Save 32% on the Zwilling J.A. 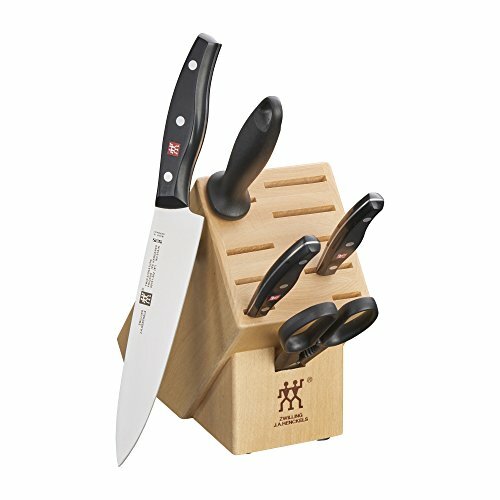 Henckels TWIN Signature 6-pc Knife Block Set by ZWILLING J.A. Henckels at Sara Stage. MPN: 30750-300. Hurry! Limited time offer. Offer valid only while supplies last. TWIN Signature knives are precision stamped from a single piece of German steel, resulting in lighter weight knives that do not compromise sharpness. TWIN Signature knives are precision stamped from a single piece of German steel, resulting in lighter weight knives that do not compromise sharpness. The knives are made of proprietary special formula steel that has been perfected for over 280 years. Combined with ZWILLING's signature ice-hardening technique, these FRIODUR blades are harder, sharper, they will NOT STAIN or chip and they retain their sharpness longer. To ensure an ideal cutting angle, the laser-controlled edge is incredibly sharp and is honed and hand-finished by the most skilled artisans. The three-rivet handle embedded with the ZWILLING J.A. Henckels logo provides optimum durability.